IIMS - Asean: Vietnam - Why is unsafe food rampant in Vietnam? Vietnam - Why is unsafe food rampant in Vietnam? 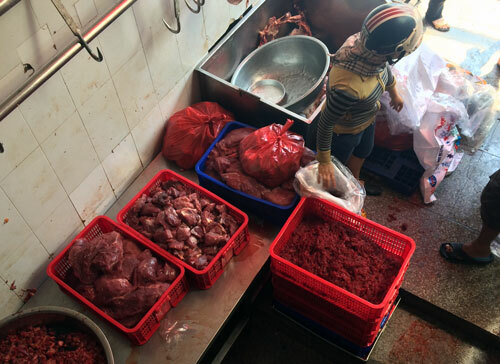 VietNamNet Bridge - Mild sanctions, greedy traders and buyers who lack knowledge of safe food are among the reasons that have facilitated the rampant use of unsafe and even toxic food in Vietnam. At midnight on a day in January 2016, a specialized vehicle of inspectors of the HCM City Veterinary Department suddenly approached Nam Phong slaughterhouse in Binh Thanh District. This facility slaughters more than 1,000 pigs each night from pig farms in southern provinces like Dong Nai and Binh Thuan to serve markets in HCM City. The inspectors detected 124 pigs positive for the banned substance salbutamol, which is used to create lean meat. The substance is very toxic to human health since it can cause cancer. However, in this "raid," the authorities could only make a record and impose administrative fine on the owner of the slaughterhouse. They could not seize the pigs with the banned substance. The owners of the pigs made a commitment to not slaughter the pigs until they are tested again to be negative with Salbutamol. In the first 10 days of inspection in early 2016, the HCM City Veterinary Department detected nearly 1,000 pigs contaminated with banned substances. The residual concentrations of banned substances in pork is hundreds to thousands of times over the permissible level. Among the violators, some committed the violation for the fifth time. 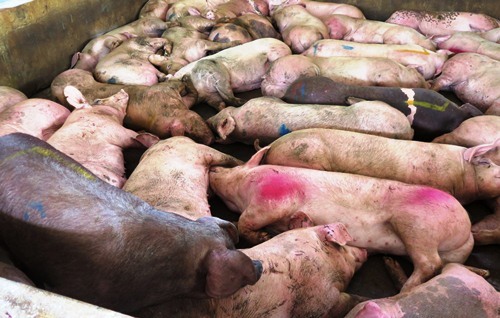 In this regard, an official of the HCM City Veterinary Department attributed the high profit as the motivation of unprincipled traders and pig breeders to use banned substances in pig breeding. "For each pig bred with banned substances to create lean meat sold to the market, the breeder earns profit of about a million VND ($50). Sanctions on the use of banned substance in animal husbandry was very mild, so it is not powerful enough to deter pig breeders and traders from using toxic substances," he said. Auramine is used to dye bamboo shoot to create the eye-catching yellow color. The Chief Inspector of the Ministry of Agriculture and Rural Development – Mr. Pham Tien Dung - said, as stipulated by current regulations, at the time of testing, if the pig urine is positive for banned substances, the authorities will keep all pigs alive for further tests. After 7 days, if the test is negative for banned substances, the authorities will allow slaughtering of pigs. If using conventional testing methods, it takes 36 hours to get the results of urine tests. The inspection agency cannot keep the pigs while awaiting the testing results because they don’t have pigsties or cold storages. In the meantime, the owner of the pigs sell them all. "If the analysis shows that the pork is contaminated with banned substances, it is easy for the authorities, otherwise they may be sued by the pig traders or pig breeders," Dung said, adding that in 2015 no batch of infected pigs was culled. Management authorities said that food testing centers were not managed or certified by the state so they have no grounds to handle violations. The HCM City Environment Department (PC49) said earlier this year the police discovered several bamboo shoot processing establishments in District 12 using Auramine to dye bamboo shoot to create the eye-catching yellow color. This substance can be easily purchased at the chemical market of Kim Bien in HCM City at the price of VND26,000 ($1.2) a kilo. This chemical is mostly imported from China, which is used in paper manufacturing and dyeing. In a report of Da Nang city, all seven samples of bamboo shoots tested in HCM City contained Auramine, which can cause cancer. Earlier this year, the Ministry of Agriculture and Rural Development added Auramine in the list of banned chemicals. But in fact, at the cost of just VND5,000 ($0.02), bamboo shoot traders can buy enough Auramine to dye 50 kilograms of fresh bamboo shoots. Most bamboo shoot sellers do not know the harm of Auramine to human health. They only know that buyers prefer to buy bamboo shoot with beautiful color. Regarding inspection of food traders, inspectors must inform the sellers about the inspection five days in advance, and this is enough for traders to prepare for the inspection. Pork is processed by chemicals to become "beef". 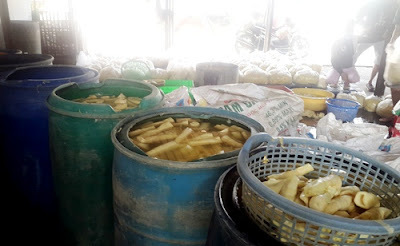 Another reason behind the unsafe food is the ineffective inspection task, said Head of the Food Safety Department of the Ministry of Health Nguyen Thanh Phong. In addition, the practices of buying and selling goods at the market, especially mobile markets, makes it difficult for food inspection. Tong Xuan Chinh - Deputy Director of the Livestock Agency - said, in addition to 9 tonnes of Salbutamol imported legally in 2015, Vietnam has a long border so the volume of illegally imported Salbutamol is uncontrolled. "The number of newly-created antibiotics and substances in the world is about 400 substances a year so we need to update to promptly detect them," said Chinh. The Ministry of Agriculture and Rural Development has issued Circular 01/2016 to adjust some contents of Circular 57/2012. The new feature of this circular from February 25th 2016 is that food management authorities are allowed to destroy cattle and poultry contaminated with banned substances on the spot. Previously, the cattle and poultry with banned substances were kept and slaughtered when the animals no longer had residue. "Previously, the violators were willing to pay fine and kept breaking the rules. Now they are both fined and their pigs are culled. They will only stop violating the rules if they have to pay a high cost," said Mr. Nguyen Van Viet, chief inspector of the Ministry of Agriculture and Rural Development. HCM City authorities have agreed to establish a food testing agency in order to control food safety in the city. However, it needs the approval of the Prime Minister. From July 1 2016, people found guilty of the act of processing, trading and use of illegal substances will be sentenced up to 20 years in jail.